My MP3 Splitter is a free, user-friendly MP3 tool that allows you to cut and edit MP3 music. An MP3 clip produced by this software has the same sound quality of the original MP3 (lossless), so you can enjoy it at its best in your favorite MP3 player. Works great for ringtones too! 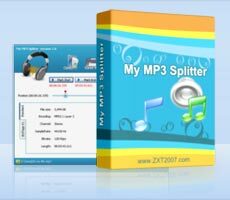 If you are a music lover and use MP3 utilities, then MP3 Splitter is a must-have free MP3 software. All-in-one powerful video converter software that allows you to modify and convert audio and video. This is a fun application designed to turn video clips into animated GIF clips in a few simple steps.